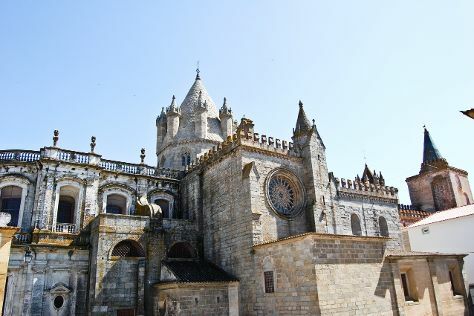 Kick off your visit on the 21st (Thu): steep yourself in history at Sintra National Palace, then steep yourself in history at Jeronimos Monastery, then step into the grandiose world of Castelo de S. Jorge, and finally wander the streets of Belém Tower. On the 22nd (Fri), you'll have a packed day of sightseeing: step into the grandiose world of Castle of the Moors, then admire the natural beauty at Quinta da Regaleira, and then enjoy the sea views from Cabo da Roca. To find other places to visit, where to stay, photos, and other tourist information, go to the Sintra trip itinerary builder app . Philadelphia, USA to Sintra is an approximately 11-hour flight. The time zone difference moving from Eastern Standard Time to Western European Time is 5 hours. Plan for little chillier nights when traveling from Philadelphia in June since evenings lows in Sintra dip to 60°F. Finish up your sightseeing early on the 22nd (Fri) so you can go by car to Albufeira. Kick off your visit on the 23rd (Sat): tour the pleasant surroundings at Praia Da Rocha and then kick back and relax at Praia marinha. Keep things going the next day: take in the architecture and atmosphere at Igreja Matriz (Parish Church Nossa Senhora da Conceição), then kick back and relax at Falesia Beach, and then stroll through Praia dos Olhos de Água. 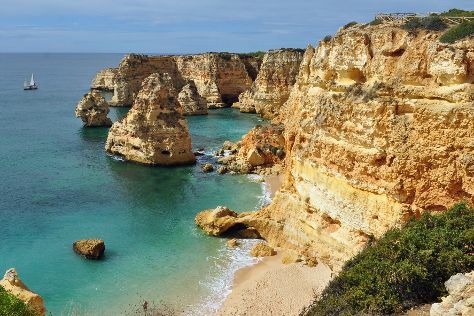 To plan Albufeira vacation without wasting time, ask Inspirock to design an itinerary. You can drive from Sintra to Albufeira in 3 hours. Other options are to take a train; or do a combination of train and bus. In June in Albufeira, expect temperatures between 81°F during the day and 65°F at night. Finish your sightseeing early on the 24th (Sun) to allow enough time to drive to Evora. On the 25th (Mon), take in the architecture and atmosphere at Convento de Nossa Senhora dos Remedios, don't miss a visit to Centro Historico de Evora, contemplate in the serene atmosphere at Se Catedral de Evora, then take in the architecture and atmosphere at Igreja de Sao Mamede, then contemplate in the serene atmosphere at Templo Romano de Evora (Templo de Diana), and finally contemplate the long history of Muralhas de Evora. Get ready for a full day of sightseeing on the next day: steep yourself in history at Aqueduto de Agua de Prata, take in the architecture and atmosphere at Igreja Matriz de Sta Maria, explore the historical opulence of EvoraMonte Castle, then explore the ancient world of Almendres Cromlech, and finally contemplate in the serene atmosphere at Capela dos Ossos. For more things to do, where to stay, photos, and tourist information, use the Evora trip itinerary website . Drive from Albufeira to Evora in 3 hours. Alternatively, you can take a train; or take a bus. When traveling from Albufeira in June, plan for a bit warmer days and little chillier nights in Evora: temperatures range from 87°F by day to 58°F at night. Wrap up your sightseeing on the 26th (Tue) to allow time to drive to Tomar. Tomar, also known in English as Thomar, is a city and a municipality in Santarém District in Portugal. Kick off your visit on the 27th (Wed): contemplate the long history of Pegoes Aqueduct, take in the architecture and atmosphere at Basilica da Santissima Trindade, then take in the architecture and atmosphere at Shrine of our Lady of the Rosary of Fatima, then take in the spiritual surroundings of Batalha Monastery, and finally contemplate in the serene atmosphere at Monastery of Alcobaca. Here are some ideas for day two: step into the grandiose world of Castle of Almourol, step into the grandiose world of Castelo de Tomar, and then contemplate in the serene atmosphere at Convent of Christ. For traveler tips, maps, where to stay, and tourist information, read our Tomar trip planner . You can drive from Evora to Tomar in 2.5 hours. Alternatively, you can take a train; or take a bus. When traveling from Evora in June, plan for a bit cooler days and about the same nights in Tomar: temperatures range from 75°F by day to 57°F at night. Cap off your sightseeing on the 28th (Thu) early enough to travel back home.